I know that I’m pretty lax on getting reviews up promptly a lot of the time, but from the copyright date to my door took two years, so I guess I’m not so bad… but on to the review. 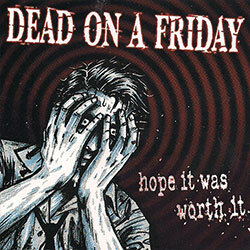 Queens New York natives, Dead On A Friday certainly have tenacity. Founded in 2002 they went through three drummers, several hazardous apartments, a nervous breakdown and countless hours of therapy (according to their bio) Finally after five long years, the band finally put it to wax so to speak. Hope It Was Worth It is 13 tracks of melodic punk. They have a very Bad Religion feel to me, but with the kind of cold gray edge you’d expect from East Coast winters. The music is tight, good quick pace, no epic length (over 3 minute) BS tracks. For sake of brevity, go find these guys and like them. Like them as much as your little heart can muster. Hope It Was Worth It does in fact seem every bit worth it.